From human-hungry-hippos, to flash mobs, students and teachers at Sackville High School are pumping-up the energy and fundraising initiatives in the lead-up to their annual SHS Dance Marathon for the IWK. Music students Matt Hustins Macdonald, Brandon Romans, Daniel Winters and Riley Prince-Gorman compose the theme song, Strength In Numbers, for this year’s six hour SHS Dance Marathon on Apr. 16, with inspiration from Mike Ryan of The Town Heroes. (L-R) Hear their song below. The countdown has begun for the big event, which will host dancers and teams from 18 schools in Halifax Regional Municipality and takes place on April 16 from 4 p.m. to 10 p.m. at SHS. “We’re challenging each student to raise $50 … and if 1,000 of our participants raise $50 we will reach our $50,000 goal for the IWK,” says Lara Fawthrop, SHS music teacher. Dance Marathon in aid of Children’s Miracle Hospitals initiated a number of years ago, but only recently came to Canada, says Marilyn MacGibbon, vice-principal at SHS. Last year the school exceeded by more than double it’s fundraising goal, raising an excess of $20,000. “We were one of the first schools to really embrace it … and we were the most successful school last year, so this year we’ve raised our fundraising goal to $50,000,” says MacGibbon. Down the hall, local award-winning musician Mike Ryan from The Town Heroes kicked back with five music students to compose an original piece of music for the upcoming event. “It’s a positive song geared at getting the kids excited,” says Ryan. The five students are excited to perform the original piece, entitled “Strength In Numbers,” and The Town Heroes will perform for about an hour during the SHS Dance Marathon. While Grade 12 percussionist Matt Hustins Macdonald says he can’t dance, he plans to put his talent to good use. “Its good for me to use what I’m good at and be able to help out … there’s always something you can do,” says Hustins Macdonald. Music student Daniel Winters plays piano in the school band and says he’s proud to be contributing to the marathon. “And when I’m not playing, I’ll be dancing for the kids who can’t,” says Winters, drawing inspiration from the song lyrics. Doherty says she is emotionally invested in the event and sparking new ways to get the students involved, such as putting teachers on skateboards and having students manoeuvre them as human-hungry-hippos. With laundry hampers in hand, students donated $120 to watch the teachers attempt to capture 1,300 plastic balls rolling throughout the school lobby. “It’s a play on a piggybank,” says Doherty. “Our co-president Sam Butler brought in $100 in nickels,” says Grade 11 student Elicia Taylor. “Whoever has the heaviest donation gets to donate the sum of the donations in their own name (to help reach their individual fundraising goal),”says Taylor. A wise strategist, Butler changed her $100 in fundraising to heavy, five cent nickels, weighing-in at 50 lbs. and registering an error on the scale. “Overall, the event shows the kids that there are people who have overcome greater challenges than they could ever imagine happening in their own lives,” says MacGibbon. “We want to help the IWK continue to do the amazing work they do,” smiles Doherty. Donations to support the event can be made through the school or at SHS Dance Marathon on www.helpmakemiracles.ca. For Dancer and Team Registration visit the school’s website. 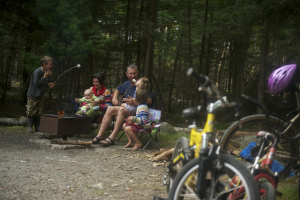 Countdown, T-minus-2-Days until Parks Nova Scotia reservation lines open for camping season 2015. Here’s how the move for some campgrounds to self-service will affect you. This camping season, ‘Ranger Google’ might be campers port-of-call at some Nova Scotia provincial parks. We asked how this will affect your camping experience. The competitive club now focuses on skill-level rather than age-level and is broken into three groups: Junior Development, Junior Competitive and High Performance, who were recently in Montreal competing. The Sackville Junior Badminton Club rallies hard to give Nova Scotia competitive badminton a national presence. “Badminton is a small community,” says Karen Stadnyk, SBC club founder. “It started in Sackville, but we’re an HRM-wide program with members coming from Halifax, Hammonds Plains, Bedford, Dartmouth, Tantallon … and even Truro,” she says. SBC formed about seven years ago in Sackville, but today only one of it’s 45 members comes from Sackville and practices are held at CP Allen, Citadel High School and Waverley Memorial. Sackville Junior Open, an open-to-anyone tournament for 8-to-22-year-olds, takes place Mar. 14 and 15 at CP Allen. Register at: www.badmintonns.ca. Information is available about after-school lessons at Canada Games Centre at https://badmintonns.ca/after-school-badminton-programs/ and Dalplex summer camps at http://athletics.dal.ca/children_youth/camps.html. There’s a photo tribute being snapped in several provinces across Canada by a photographer who discovered it’s not about trying to teach an old dog new tricks, but rather, looking them in the eyes and revealing soulful evidence of long lives lived, just beyond a decade. A graduate of NSCAD, Toronto-based photographer Pete Thorne returned to Halifax in early January to photograph portraitures of elderly dogs from all over Nova Scotia for his Old Faithful Project, a collection of images and stories being published by HarperCollins later this year. “They say Boston terriers are often referred to as ‘American gentlemen’ and that’s George, an American gentleman,” says Sheila O’Hara, who spent much of her life living in Halifax. “Now that George is a senior, I know our time together is limited and Pete’s project is a perfect memory for us both,” says O’Hara. Thorne says he became inspired after photographing his grandmother on her 100th birthday and decided elderly subjects had much to reveal. Thorne began focusing on elderly dogs, initially unclear where the journey would lead him. It’s RBC Sports Day in Canada and Sackville Waves Aquatic Swim Team in Nova Scotia were celebrating and making a splash in the name of sport… all before 7:30 a.m. Happy RBC Sports Day Canada! Dare to be awesome. She spins this weekend in Poland to break the Guinness World Record and has been raising funds for CDN charity for violence-affected youth (Leave Out Violence). Well done Olivia and best of luck! Apparently, ‘not her fastest spin’ but it is super impressive! I had the pleasure of interviewing inspiring, local ice-skater, Olivia Oliver. Passionate and determined, she plans to break the Guinness World Record in Warsaw, Poland, spinning to raise money for children who’ve experienced violence. Find out in Sept. 23 issue of Community Herald, why she’s attempting more than 5 spins-per-second for 300 rotations in a minute, and who else she’s been helping, all while navigating the waters of elementary school and being a tween. Christmas baubles filled with tiny pieces of driftwood, shells and sea glass by Rita Laidlaw of Sea Glass Design from Dartmouth. Searching for that uniquely crafted Nova Scotian gift this holiday season, but missed Christmas At The Forum? Fear not, many of these crafters will showcase their wares at the upcoming Dalplex Christmas Craft Market and their homespun flare can add a touch of maritime magic to a season often filled with commercially packaged, over-produced products. Handmade wooden games and crafts by Ken Grandy of Uncle Ken’s Woodwork displayed at Christmas At The Forum on Nov. 7. “I love games,” says Ken Grandy of Uncle Ken’s Woodwork in Lawrencetown. Grandy hand carves his games locally and sells them on Kijiji under the name UKW. “I have washer toss and the jenga game, called Stacked, goes up to six feet tall,” says Grandy. For the full story see the Halifax Citizen. “We’re taking orders up to about the fourth of December, depending on where it has to be shipped … we also do gift cards,” says Allen. A portion of every doggie hat sale goes to Bide Awhile animal shelter in Dartmouth. People can purchase at her home studio, by appointment or visit http://www.GabsandEddy.com. “I take previously loved jewelry apart and recreate it,” says Merlin Walsh of Merlin Walsh Designs. She also creates uniquely ornate windchimes from silver tea pots and cutlery. “The balls are filled with tiny pieces of driftwood, shells and sea glass we’ve collected throughout the summer,” says Laidlaw. She says Cape breton is her favorite place to collect sea glass and says there’s a beach near Inverness that’s a goldmine for collecting sea glass for her jewelry. Christmas balls start from $14. “Everything is handmade, beach-themed,” says Derek Stewart of Shore Things from Fisherman’s Cove in Eastern Passage. “We recycle and upcycle everything we have in our booth,” Stewart says he’ll be at the Dalplex Christmas market and possibly at Atlantic Superstore on Portland St., Dartmouth in Dec.
“We paint paddles in varying colours starting from about $40, and we also do the buoys,” says Byron Edelmann of Traditional Marine. Traditional Marine harnesses quintessential maritime, selling everything from mermaids, to cod jigs and hand painted ores. The family business is based in Annapolis Royal, but despite the distance, owner John Edelmann says they sell their products online at http://www.traditionalmarine.com, shipping around the province. “We paint paddles in varying colours starting from about $40, and we also do the buoys,” says Byron Edelmann. Artisan Kimiko Willgress says she makes her Prana Rock candles by hand and most of the rocks come from all over Nova Scotia. Nature’s Natural Solutions in Bridgewater produces a line of goat milk skin care products that Michelle Breen, a Tantallon-based sales representative says make excellent stocking stuffers. “Great Christmas gifts would be our soaps, and our lip balms and deodorants make great stocking stuffers,” says Breen. Dalplex Christmas Craft Market takes place Nov. 28 to Nov. 30. in Halifax. Innovation, inspiration and advice from one of Canada’s leading female entrepreneurs. A local entrepreneur and educator from Hammonds Plains is one of 18 finalists from across Canada, nominated for a 2014 RBC Canadian Women Entrepreneur Award (CWEA). From 4,000 nominees, Pamela Streeter, executive director of Creative Kids Education Centre and Birch Hills Academy, is one of three regional finalists, and is nominated for a Micro-Business Award at the national ceremony celebrating leading Canadian female entrepreneurs. Streeter has been setting successful lives in motion for more than 25 years, with a focus on delivering reading, learning and socializing skills through her preschool, elementary, middle school, school-age and day camp programs. Q: What inspired your entrepreneurial path? “I’m a mother of three children. I had always seen myself as being at home with my children. Fortunately my field of expertise was in early education. When my children were really young and I wanted to contribute more to my family, and also to challenge myself, I opened up a preschool in my home. When my children started school, two of them didn’t learn to read in the public school system. It started me on this investigation as to why that was, what we could do better, how could I help them. I learned we can do this easily. I started implementing pre-reading strategies into our early learning programs. Parents would come back and reinforce the need existed. I was an entrepreneur prior to that, but it helped shape the path I took. Offering the reading through a school setting seemed to make sense. Streeters advice to local women entrepreneurs and her thoughts on the nomination in the Halifax Citizen. The 22nd annual RBC CWEA recognizes women entrepreneurs who make impressive contributions to their local, Canadian or global economy. Winners will be announced an awards gala in Toronto on Nov. 26. Sandwich the message between a <strong> code and it reads bold and clear. That’s a message Rachel Aaron says she wants to deliver to girls eight-to-13-years-old on Sat. Nov. 8th, when Ladies Learning Code, a national non-profit organization, hosts its first Halifax event geared towards girls. The free workshop is a full day working with mentors and learning the fundamentals of building a website through a mix of hands-on learning and games that reinforce the concepts. HTML, or hypertext markup language, lays the foundation of content on the worldwide web and CSS, or Cascading Style Sheets, essentially makes it pretty. Targeting children as young as eight-years-old, introduces a behind-the-scenes look at technology, at an age when kids can learn language quickly, says Gab White, the second Halifax co-lead of Ladies Learning Code. A graphic designer and developer, White says learning as young as eight, can sometimes be easier than starting at 12-years-old. Aaron says by age eight, children have the fundamental math concepts helpful for understanding coding. While enrolment is currently wait listed, information on upcoming workshops is available throughwww.ladieslearningcode.com and to sign up as a mentor or join the waitlist, see Girls Learning Code Day: Intro to HTML & CSS in Halifax! on EventBrite.ca. Rain held off and sun shone upon two slick new activity courts at the grand opening of the Annex at Glen Arbour playground on Aug. 9. More than 50 people came to see the expansion, including the only playground bocce court in Nova Scotia, an elaborate shuffleboard court and a horseshoe pit. “You can be two years old or you can be 99 years old and you will be able to use the facilities,” said Sylvianne Forbes, president of Glen Arbour Homeowners’ Association, as children gathered around HRM Councillor Matt Whitman (Hammonds Plains-St. Margarets Bay) and Hammonds Plains-Lucasville MLA Ben Jessome during the ribbon cutting. Forbes gave a special thanks to the city and the province through the department of Health and Wellness, for their donations of $5,000 each towards the project and said the overall playground construction and expansion took about six years, with the expansion costing upwards of $35,000. Matthew Mallard, Sarah Mallard and Patrick Cooke tryout the new shuffleboard court at the opening of Glen Arbour playground expansion, including a shuffleboard court, horseshoe pitch and the only playground bocce ball court in Nova Scotia. Grant Jarvis given local children a demonstration of shuffleboard at the new Glen Arbour playground expansion opening on Aug. 9. Entrusting a child into daycare or family-run childcare can be a daunting experience for parents. Researching available choices can help navigate these waters, finding the best option to fit the needs of every family. Angie Bryant knows the benefits of both larger childcare centres and smaller family-run facilities. Bryant is executive director of Fox Hollow Child Care Centre and Family Home Agency in Upper Tantallon. Angie Bryant, executive director of Fox Hollow Child Care Centre and Family Home Agency in Upper Tantallon created a fairyland oasis at Fox Hollow, filled with cosy corners, nooks and natural landscapes. “For a stay-at-home mom who wants to mind other children along with her own, she doesn’t have get licensing through Department of Education and Early Childhood Development services,” says Bryant — a former EPA — provided they don’t exceed six children. Family Home Day Care Programs provide care options for children from birth to school age, in a home monitored by a regulated family home daycare agency. Community Herald interviewed early childcare workers in Dartmouth, Sackville, Prospect Bay and Upper Tantallon. For a look at childcare options, big and small, read the full story in today’s Community Herald. “Most families of preschool-age children between three and five-years-old, want to know their children are being prepared for going into primary school … they want to know if a facility offers a school readiness program, and our answer to parents is yes,” says Barb Wade, director at the Sackville location of Adventurers Child Care Centre. Halifax West learning centre teacher Jenn Bennett with EPA Glendalee Clattenburg and students Fallon Osmond, Andrew Conners and Umar Ali (L-R). Students love anything dirty, messy and outdoors, according to Jenn Bennett. “So what more can you ask for then a school garden project,” exclaims the learning centre teacher from Halifax West High School. But there’s plenty more than seeds rooting beneath the soil of the students’ raised-bed, low maintenance gardens. Over at CP Allen High School, students are preparing a garden of their own. “Right now they’re measuring and doing some science. They’re measuring every 12 inches and plotting out squares for each vegetable,” says Jill White, the HRSB school nutritionist, as she watches the learning centre students digging and planting amid an early June mist. “The garden gives a great opportunity for teaching that food comes from the ground, not a package. But it also builds independence and self-confidence,” says White. These two high schools are among 32 schools awarded grants for gardening this year. “We supported schools with close to $20,000 in garden grants through the Department of Health and Wellness,” says White. “You get to help other people and build skills … it’s school but it’s not like school, it’s really fun,” says Colleyne McDonald (R) with fellow Halifax West O2 student Sara Macdonald (L) showcasing dollhouses to be donated to IWK Children’s Hospital. Students are getting their hands dirty, constructing confidence and community links through service learning and real life opportunities. Service Learning Week began June 2, when students across Nova Scotia showcased projects focused around community engagement and tangible outcomes. Grade 10 students at Halifax West High School built 10 ornately detailed dollhouses to donate to IWK children’s hospital as part of their project. “We just graduated six from our flooring program on Friday and two went to work the very next Monday … and four were told they’ll get work within the next week,” says Bev Young director of Carpenter Millwright Trades College in Lower Sackville. For the complete story see Community Herald. The Summer 2014 issue of Dakai Maritimes is online and around town. Learn how one international SMU graduate is changing the rules of business in Halifax and finding there’s more to mattress money than pocket change. But despite his business earning $250,000, the government has told Chen Qing to stay in Canada, he’s got to find another job. And the resilience of many local entrepreneurs attending Fusion Halifax Immigrant Entrepreneur Showcase are making Halifax a better place to live, work and play. Event organizer Jennifer Liu, Director of Immigration and Diversity, Fusion Halifax greeting guest in atrium of Innovacorp. SMU student Sasha Zhang attended the showcase and says she’d like to make Halifax home if she can find gainful employment. Event organizer Jennifer Liu, Director of Immigration and Diversity, Fusion Halifax, giving closing words at Fusion Halifax Immigrant Entrepreneur Showcase. For the full issue of Dakai Maritimes click here. Emily MacDonald is part of Halifax Cycling Coalition and committed to improving conditions for cyclists in Halifax. HRM Bike Week is here and a coalition of avid cyclists are breaking down the barriers of cycling-the-city and shifting Haligonians’ non-recreational biking habits into gear. Find the Community Herald story here. Emily Macdonald hopes to encourage as many commuters as possible to park their cars and cycle, whether it’s getting to the office or simply travelling for a loaf of bread. She’s part of Halifax Cycling Coalition, committed to improving conditions for cyclists in Halifax. Kitted out with cycling travel, safety and comfort gear, Macdonald spoke at a recent Friday lunch and learn session at Seaport Farmer’s Market. Lane Farguson attended the lunch and learn, looking for information on how to get biking to work from Tantallon. “If I were to put it on my car and then leave my car on St. Margarets Bay road, there’s a parking lot there.” Farguson (39) says he could then continue cycling to his work at the Port Authority. Lane says his employer encourages employees to cycle and provides onsite showers and lockers. “That’s not the issue, it’s just getting from Tantallon to here,” says Farguson. Don’t sweat it: Macdonald says don’t let helmet head deter that ‘clear-your-mind’ ride to the office. She encourages employers to foster healthy and energized employees by offering bike racks and providing a ‘clean-up station’ for employees. Employers, she says, could spoil employees with showers and lockers to store extra clothes and ‘clean-up’ gear. She says the 6,000 employees working in Scotia Square can access lockers and showers. Macdonald says some local employers keep a bike pump at work in case of a flat and taxi vouchers for emergencies. HRM’s Smart Trip program helps encourage employers to support employees in finding eco-wise ways to commute to work. Commute too long: Macdonald suggests taking the commute one step at a time. Drive part way and when traffic gets congested, park the car and cycle. Metro buses have bike racks for cyclists. Find a route that best suits individual commuter times and travel conditions. She says cycling is a great way to multi-task a work-out into travel time, maximizing efficiency. Scary route: Fast cars, narrow roads and too much traffic can all act as barriers. “A lot of time it’s a perceived fear that prevents people from biking. It’s about building up confidence and teaching safe ways to commute,” says Macdonald. Social Media: Macdonald suggests posting on FaceBook’s Halifax Cycle Chat forum. “Just say, I need a way to get from here-to-here and I’m comfortable on these types of roads.” She says there are hundreds of cyclists on the forum to help get people biking. “Cars are legally required to give a metre of space in order to pass a cyclist, which includes crossing the yellow line,” says Macdonald. She says sometimes, in areas with potholes, it’s safer to pick a lane to avoid swerving. Use a bell when passing pedestrians on trails. Newbie cyclists can be too hard on themselves, trying to cycle everyday. Build up slowly starting with once or twice a week. Macdonald says biking with a friend is easier than going solo. Bad weather: “It doesn’t matter what time of year you bike, it’s just the way you dress. I bike all year … it was no problem really,” said Tim Bell. Bell lives on Bayers Road and bikes to work on Chain Lake Dr. While bad weather doesn’t discourage Bell, construction along Chain Lake Trail will prevent him from cycling to work this summer. Panniers are great to transport a change of clothes, toiletries and other essentials, says Macdonald. From shopping, services and dining, during HRM Bike Week, June 6th to June 15th, cyclists get discounts. See www.halifax.ca/bikeweek/Offersforcyclists.php for details. Check www.iheartbikeshfx.com for city bike routes, recreational cycling maps and connect with cycle-happy folks. There’s a powerful chord resonating from Lower Sackville on Saturday mornings, as a diverse group of musicians converge from all facets of Nova Scotia community life, proving high school graduation shouldn’t be a time to pack away those French horns, clarinets and oboes. Together, this array of passionate players make Sackville Concert Band, one of Canada’s premiere concert bands, composed of passionate players, retired professional musicians, former Stadacona Band members and music teachers, like band president Tom Rusinak. “There’s the Symphony, then HMCS Stadacona Band, then us,” says Rusinak. He’s enthusiastic about engaging the Halifax community to come and enjoy their playing, take part in their concerts and embrace music for life. Sackville Concert Band members Tom Rusinak, Bradley Reid, Steve Rigden, Mike Johnston (L-R). Morning rehearsals at Halifax Community Band Festival at Saint Mary’s University. Second Chances Community band of NS rehearsing at Halifax Community Band Festival at Saint Mary’s University. “A lot of wonderful things have developed out of these band festivals … having professionals sitting with amateurs, the professionals realize why they got involved in music in the first place,” says conductor and music director Laura Mercer of Second Wind Community Concert Band from Cape Breton. CNIB presenting to seniors at Sackville Manor. Seniors in Sync is a dynamic group of volunteers helping seniors take health into their own hands and building a sense of community along the way. The idea sparked almost a year and a half ago, said Liz Hamilton, a Bell Aliant Pioneer, while addressing an enthusiastic room of about 30 seniors, gathered in Sackville Manor’s bright common room for an information session on vision. Along with Helen Mahaney, the two volunteers “became involved with a dynamic trio of women from Sackville Manor; Kay, Barb and Catherine,” said Hamilton. “With cutbacks with respect to health, we have to be proactive and take health into our own hands,” said Mahaney. Sunyata Choyce, founder of Project COLORS, had no way of knowing her decision to detour to a South African orphanage, home to 55 aids orphans, would catapult her into the full-time life as a NGO worker. “If I let every little thing that backfired stop me from helping with Project COLORS , then so many kids wouldn’t have water, wouldn’t have gone to school, the teachers wouldn’t have had the Early Child Care education training, all those schools all over the world wouldn’t have these first aid kits … you have to look at the bigger picture. If you try a few things, something is bound to work out,” says Choyce. Those were the opening remarks to an energized crowd, as Henk van Leeuwen, CEO of Easter Seals Nova Scotia and Scott Jones of Don’t Be Afraid, announced their alliance and the kickoff of the countdown to The Drop Zone 2014. “Scott’s cause is our cause and his message is our message…it’s about being free of fear to be yourself, it’s about being ok and being empowered to be yourself everyday…regardless of the color of your skin, or your sexual orientation or your faith,” said van Leeuwen during the press conference. Henk van Leeuwen, CEO Easter Seals Nova Scotia with Scott Jones of Don’t Be Afraid Campaign with Easter Seals Nova Scotia client at the kickoff of The Drop Zone fundraising alliance. Scott Jones of Don’t Be Afraid Campaign with Easter Seals Nova Scotia clients at the kickoff of The Drop Zone fundraising alliance. “Challenge yourself and change lives” is the mission at Easter Seals. “There’s such power and leverage in strategic alliances, we’re helping to promote each others campaign…ultimately, I think we’re the same campaign,” said van Leeuwen. Read about in the Community Herald. Debilitating pain at the age of thirteen inspired Dr. Diana Tong Li along a life changing path of Chinese traditional medicine, healing and a thirst for education. Read the Spring 2014 article in Dakai Maritimes. The growing season looks bright, according to local growers attending Loblaw’s annual assembly last week. More than 60 maritime growers, representing the rainbow in produce, filled a room at the Comfort Inn in Bayer’s Lake. “It’s a true honour for us, it’s a lot of hard work over the years and to be recognized by our customers as being an outstanding supplier is quite an honour,” said Andrea Palmer of Nova Agri Farms and Country Magic. Read about the latest trends in produce and how local farmers are innovating for sustainability in the Community Herald. Hammonds Plains residents have long discussed the idea of a neighborhood pub; a place to meet friends and share a pint and a conversation, without having to travel to Bedford or Tantallon. When news spread that local entrepreneur Ed Webber was expanding his successful restaurant, bakery and take-out, Edible Matters, to include an upstairs pub, many residents said it couldn’t come too soon. But locals will have to wait a little longer for that pub, about six to nine months longer. Find out why in the Community Herald. “When HRM created the planning strategy for Hammonds Plains many years ago, it was a pure bedroom community… really single family with some commercial and convenience stores, but nobody envisioned a neighborhood pub… What we’re trying to do now is catch up and the pub is just a natural evolution,” says Kevin Riles, president and CEO of KWR Approvals. Let’s teach our boys and girls some Insta-Etiquette. I fought Instagram with my daughter. She was one of the last in her class (so I’m told). I always say it takes a village. So I chatted with parents, with my daughter and did some research. When I felt comfortable, we signed her up. The legal age to get an Instagram account is 13-years-old, despite many of her friends younger siblings snapping and sharing. She’s in Grade 7 and 13-years-old and along with all her other classmates, she’s cautiously delving into a world of selfie-narcisism, the search for self-validation and image rating, armed with our family house rules for online interaction. Don’t care to a #WCW on Instagram. Don’t care to be objectified. You post the photo and your followers comment, share and converse about it – usually reassuring how lovely you look. A boy in her grade had posted an image of her on his Instagram Wall stating she is his #WCW. #WCW refers to ‘Woman Crush Wednesday’ (note the ‘Woman‘) and has been around for a few years. This is where men share images of celebrities or woman they’re crushing on, they ‘like’, they adore, etc. There’s also images of coffees, pets and children, but for the most part, it’s men crushing on women. For the record, there are #MCM ‘Man Crush Mondays’ too and this advice goes both ways. Take a peak on your own Instagram or child’s account and search #WCW and see what images appear. Welcome 50 Shades of Selfies. Boy posts image and labels it as his #WCW. What unfolds is an easy forum for hurt feelings, embarrassment, discomfort. I’m all for crushes – but is there a healthier forum? I happened to come across a post of my daughter and a few girls from her swim team, in their team change room, in a group photo… in their bathing suits. I immediately flagged this for removal from the online world and my daughter asked her teammate to remove it from her Instagram wall. She did – no harm, no foul. Her friend hadn’t realized taking images in a change-room is a huge ‘No No’ – and my daughter, caught up in the moment, obviously forgot. Remind your kids of the Rules: rules are easily forgotten in innocence at this age and it’s our job to help keep them on track. Boys: Ask before we post: DON’T use a girls image, photo, name online unless there is mutual consent. Maybe she doesn’t want to be labelled as your crush for others to comment about? Let’s stop objectifying girls online. Same applies for girls. Boys & Girls: #PTD: Please Take Down: If you don’t like an image out there, it’s your right to ask it be removed. But, you have to accept this may not happen — so be careful what image you project, what you snap and allow to be snapped. Boys: So you have a crush. Great on you! Now man-up and talk to her in person, have a REAL conversation. If the feelings are mutual – terrific. If they’re not, you’ve given it a brave shot, shown her your mature enough to connect in person and it’s time to move on – offline. Girls: BE careful what image you project. You’re posting to your future and it will be out there and most certainly shared. Don’t project an image online that isn’t reflective of you. You’re more than the sum of your body parts! If the Dalhousie Dentistry School FaceBook posting teaches us anything, it’s that teaching boys limits and respect, both online and offline, must begin at an early age. Some info on recently added Instagram features affecting your teens safety check out uknowkids.com. High school students from Halifax Regional School Board put their carpentry skills to the test during the 2015 HRSB Regional Skills Competition in Lower Sackville last month. “We’re really excited to have seven schools represented from all over HRM,” says Bev Young, director of Carpenter Millwright Trades College (CMTC). Up from four schools in 2014, the 11 students arrived at CMTC for 7:30 a.m. and were given a blueprint, tasked with building a garden shed using materials donated by Atlantic Canada Regional Council. HRSB high schools students, representing seven schools, competed in the 2015 HRSB Regional Skills Competition at Carpenter Millwright Trades College. First place CP Allen student Chandler Slater and second place Matthew Devoe, from Halifax West will go to the provincial competition later this year. Third place was awarded to Tyler Slaunwhite, from Halifax West. “The roof rafters are a little bit tricky, but I have them under control now,” says Zack Harnish, a Grade 11 student from Cole Harbour High School. It’s Harnish’s first year in the competition and he says he expects to have the roof on by end of day. “I built a lot of stuff like this with my dad and my grandfather,” says Harnish. “3:30 p.m. is tools down,” says Young. She says while some will be close to completion, they don’t expect the students to finish. The structure is similar to last year’s dog house, but four feet taller. The scaled-up challenge was chosen to give finalists an advantage at provincials and nationals. HRSB Regional Skills Competition at Carpenter Millwright Trades College, first place Chandler Slater from CP Allen will go onto represent HRSB in the provincial carpentry skills competition later this year. Key competition factors include accuracy, measurements, neatness and safety. “All big factors, but end of the day, the main objective is to give an experience of competition and showing off their skills; learning where they can improve; and the carrot of course, is moving onto the provincial competition,” says Young. Read the full story in the Community Herald. ‘It takes a village.’ A phrase often describing support by the greater community in helping a child. Local mom Tara Weston is reaching out to her community: a last effort to keep her son’s wheelchair lift van and pay his remaining medical bills. Her goal is to crowdfund $5 from 5,000 people, to raise a total of $25,000 in support of Noah’s journey. “I’m just trying to put myself in a positive mindset. If 5,000 people gave $5, we’d have Noah’s van,” says Weston, who recently had to sell their family home to keep Noah’s fundamental transportation. “If we can’t raise the money … and we lose this van, Noah basically has no access within the community anymore,” she says. Noah has stage five spastic quadriplegia and cerebral palsy, he is legally blind and is speech impaired. Soon he will undergo his 38th surgery at the IWK. Despite Noah’s many surgeries and daily seizures, his smile is full of joy and “he has chocolate eyes that melt your heart,” says Lauren Emanuel, student and services department head at CP Allen High School. “They’re having a giggle-fest today,” says Jenny-Kate Hadley, vice principal at CP Allen. Noah and his friends sit laughing around their classroom table. “Noah is so engaged with the students,” says Emanuel. Weston says the family has spent close to $220,000 over the past 15 years and his ongoing nursing and attendant needs have been assessed in excess of $7,600 per month. “We’ve great health care coverage here in Canada, but between insurance and provincial health coverage, it doesn’t cover all his medical expenses,” says Weston, leaving $3,800 each month not covered. The family recently moved to an apartment in Bedford, from their family home specially designed for people with special needs. Having exhausted every avenue of financial help, from non-profit, government, friends and family, Weston says $5 from 5,000 is literally their last resort. With more than 400,000 people living in HRM, it’s a goal she says she hopes is attainable for Noah. Read more on Noah’s Journey in the Community Herald. *Note: Since last week the family has raised $1,256 in donations and are now hoping to raise $23,000. To donate, go to www.youcaring.com/medical-fundraiser/noah-s-journey/201524 or find the link by visiting Noah’s Journey on Facebook. “With our heat pump, we went down about 35 per cent on our power bill by just changing the water heater,” says Steven Weagle, president of Sunflower Solar. Spring is not quite here, but meander around a bend on the Bedford Highway and a 25-foot sunflower is in full bloom at Farmer’s Best market. The off-grid solar beacon of sunshine was recently installed by Sunflower Solar and together the two businesses are cooperatively marketing solar energy to Nova Scotians. “Solar has never been more affordable than it is now … we’re a little bit behind in Canada, but we’re catching up,” says Kirsten Weagle, one of four partners at Sunflower Solar Inc.
“Solar is totally modular so just about anything is possible from a homeowner or even a commercial business perspective,” says Weagle. Originally from Lower Sackville, Weagle says he loves technology and being hands-on with innovating solar power. He says the sunflower project took about a year and a half and is a labour of love and a progression from engineering solar-powered hot dog vending carts in Ontario and Nova Scotia. Read how solar power can reduce your household energy bills here. For more info on solar energy visit www.sunflowersolar.ca and for solar energy solutions and rebates information visit www.efficiencyns.ca/energy-solutions/solar.